Dendritic cells (DCs) are the most professional antigen-presenting cells and play a central role in eliciting specific adaptive and humoral immune responses. These features make DCs a very attractive tool for immunotherapeutic approaches. 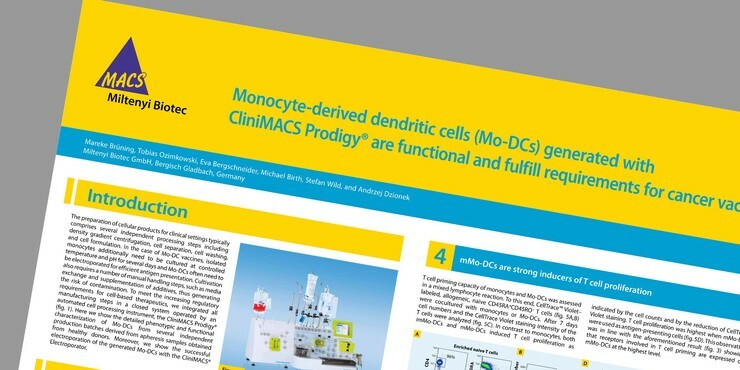 The preparation of cellular monocyte-derived dendritic cell (Mo-DC) products for clinical settings comprises several independent processing steps including density gradient centrifugation, monocyte separation, cell culture (differentiation and maturation), and possibly electroporation. To meet the increasing regulatory requirements for cell-based therapeutics, we have integrated all manufacturing steps in a closed system operated by an automated cell processing instrument, the CliniMACS Prodigy® with CliniMACS® Electroporator. This comprehensive brochure provides information regarding next generation clinical-grade production of DCs that may allow optimization of cellular products, formulation, and efficacy. Join Cristina Conforti Andreoni and her webinar on the past, present, and future of monocyte-derived dendritic cells in translational research. She covers the challenges and solutions of Mo-DC manufacturing for clinical research and the means to bringing DC therapy to the next level. Recent reports suggest that simultaneous activation of different DC subsets may have a synergistic effect that can increase anti-tumor responses. We have established the idea of a new clinical approach based on primary DCs derived from peripheral blood using the CliniMACS Prodigy System. The CliniMACS Prodigy CD1c/CD304 Enrichment and Activation System enables fully automated production of BDC-based vaccines with high purities and recoveries. The CliniMACS® System in combination with our MACS® GMP Product Line offers a comprehensive portfolio optimized for the ex vivo GMP-compliant generation of DC vaccines.